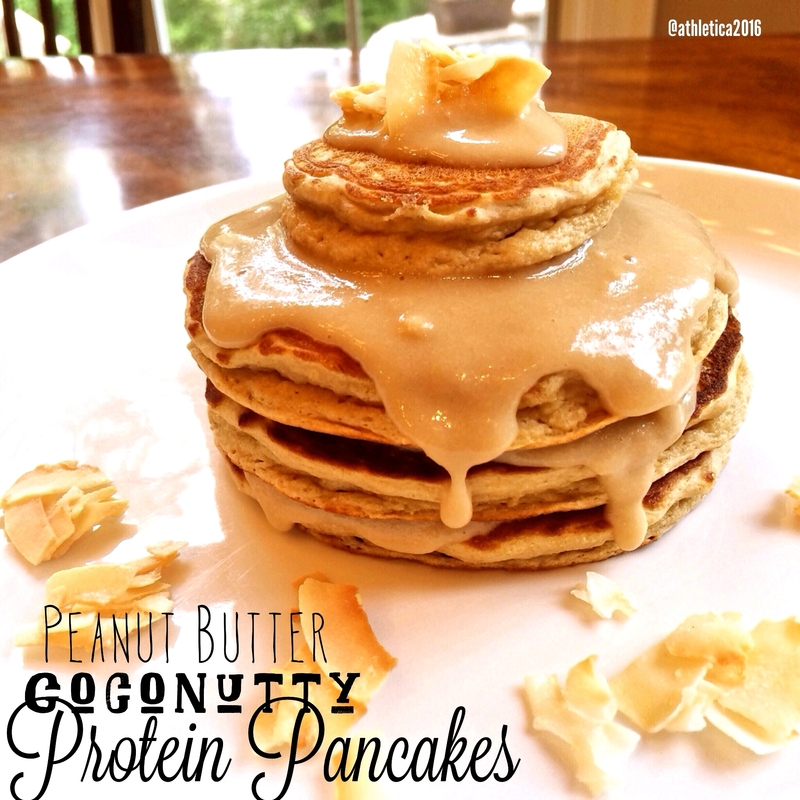 30 g oat bran (ground to flour- I use a coffee grinder it) ,1 TBS coconut flour, 1/4 tsp baking powder, 1/8 tsp baking soda, 1/2 scoop PB protein powder (I used cellucor peanut butter marshmallow protein powder (Or use vanilla protein and add 2 tbs PB2 or peanut flour), 1/8 tsp coconut extract, 2 packets stevia and mix well. Add water slowly to batter until its a spoonable pancake consistency. (different protein powders used will change exact amount of water. Heat skillet over medium low heat and add 1/3 to 1/4 of the pancake batter to pan. Cook pancake until edges look dry and bubbles form, then flip pancake and finish cooking. Repeat these steps for the rest of the batter remaining. For the topping combine 1 TBS coconut flour, 2 TBS SF maple syrup, 1 TBS vanilla protein powder (or I used corfetti cake batter flavored), dash of coconut extract, then stir in water or almond milk until drizzle-able or desired consistency. Top pancakes and enjoy!